Do you ever crave something chocolatey, crunchy, and delicious? But you also want to stay healthy, grounded, and clear? So do we. That’s why we made these bliss balls. They are the perfect, no bake, on-the-go, quick and easy snack you can keep in your fridge during the busy week. Enjoy them for a quick energy booster or for a fun little dessert. Indulge and enjoy! Soak the dates in hot water for 20 minutes, drain and blend them in a food processor or blender. Melt the coconut oil on the stove. Mix the dry ingredients (sunflower seeds, almond meal, chia seeds, desiccated coconut, cocoa powder, and cinnamon). Add the melted coconut oil and blended dates to the mix. Blend until well combined, until the mixture becomes sticky. 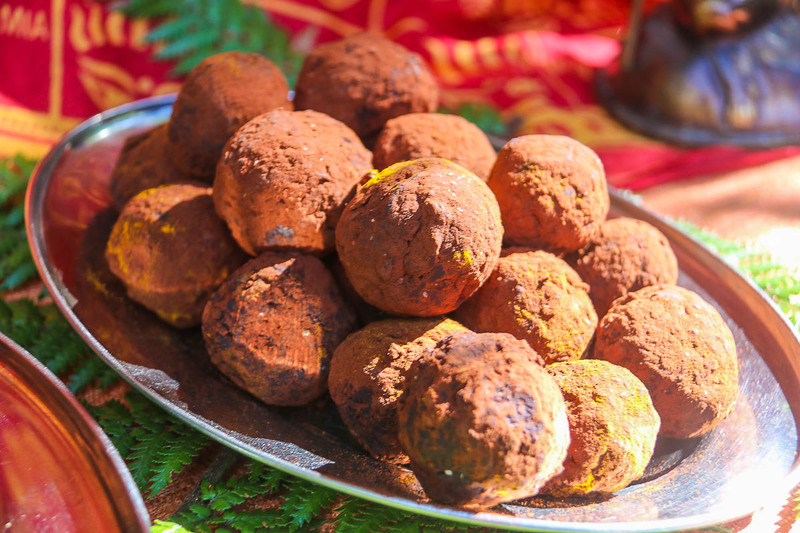 Roll into balls using your hands, then roll in cocoa powder to coat the outside. Serve & enjoy your chocolatey balls of bliss!